It’s a very exciting day, and the reason is because I finally get to talk about a new Godzilla movie. Shin Godzilla is Toho’s first movie featuring the King of the Monsters in 12 years, which makes this all the more exciting. I’m a huge fan of this franchise, from the goofiness of Godzilla jumping around on the moon in Destroy all Monsters to the much darker entries like Godzilla vs. Destoroyah and even the 2014 America remake. Shin Godzilla does something very interesting and moves the tone into a much more realistic direction. This makes for a very interesting and surprisingly intelligent entry into the series that also happens to have some of the best scenes of destruction and mayhem in the entire franchise. After a boat is attacked in Tokyo Bay and the Tokyo Bay Aqua-Line is collapsed, both by some mysterious aquatic creature, the Japanese government assures everyone that this monster will not come on land. Of course, they couldn’t have been more wrong as a bipedal, gilled fish creature begins making its way through the city and destroying everything in its path. 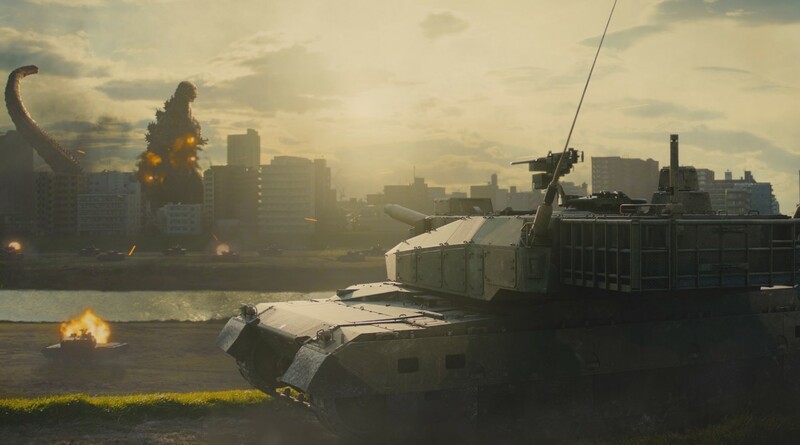 Things are made worse after the JSDF attacks the creature, which causes it to stop its war path and begin growing and evolving into a giant reptilian monster that is named Godzilla. With Godzilla moving further into Tokyo and causing rampant destruction with countless casualties, the government scrambles to rebuild itself from the initial attack and work together with foreign powers from around the world in helping them take down this behemoth before it’s too late. Where do I even begin? There’s so much that I want to say. I guess let’s start with the monster of the hour. Godzilla looks outstanding in this movie. The first time you see him he looks like this weird salamander with legs, which is a great introduction believe it or not. You then get the pleasure of watching him evolve into the creature that we all know and love. It’s also a treat to see that this Godzilla is the biggest ever to be put on screen, even beating out the Godzilla in the 2014 American film. This is a ferocious Godzilla and certainly not the one you may remember from the earlier films where he often time played the hero. 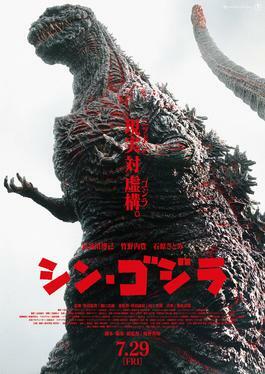 Shin Godzilla is, in many ways, a reboot of the original film from 1954, which works really well. While it’s similar to that movie, Godzilla has a lot more to do and, without spoiling anything, has received a lot of badass enhancements that you’ve never seen in a Godzilla movie before. One thing that the newest American remake has over any of the other Toho versions is the special effects. Save for the shock of seeing a monster destroying a city in the original movie, the effects in this franchise haven’t really been too spectacular. This made me have no real expectations for how Shin Godzilla would look. I’m shocked at how great the effects were. There’s a few kinda strange looking scenes, but as a whole it looks great. Godzilla looks massive against the backdrop of the cities and his atomic breath has never been better. The effect work for the military is also really good. The tanks and helicopters hot on Godzilla’s trail move and sound great. I also have to give a lot of credit to directors Hideaki Anno and Shinji Higuchi for their creative abilities in shooting this movie. The camera always seems to be in motion and there are some really interesting shots that heighten the action more than I’ve ever seen in a Godzilla movie. You can tell these film makers had a vision and they executed that vision very well. A big part of any Godzilla movie, or even any kaiju movie in general, are the people who are either trying to stop or help the monsters. Normally, those are the most boring parts of the movie, and it’s rare that there are ever any really interesting characters. Shin Godzilla follows a group of government officials and scientists who are constantly brainstorming ways to stop Godzilla from completely destroying everything. While there still really aren’t many characters in this movie that I cared for too much, I cared about their mission and it was interesting watching the process they went through. It’s a very modern take on this story that has a lot of allusions to the 2011 earthquake and tsunami that still has an affect on Japan to this day. This brought the politics and the economic fallout of a disaster as fantastical as Godzilla seem real and grounded. The most exciting parts of this movie of course revolved around Godzilla and the military strikes, but the scenes that take place in offices and labs still hold up well and brought a lot to the story when all of that information could have simply been lost in the action. I had some doubts going into Shin Godzilla despite all of my excitement. Luckily, I’m in no way disappointed. This is a great entry into the franchise and possibly one of the best one since the 1954 original. There’s great special effects, outstanding action, and a story that feels very current and smart. This is a Godzilla movie that is made for the people who know and love the franchise, but is also a great place to start for people with no experience with these movies at all. This is how a monster movie is done and I couldn’t be happier with it. 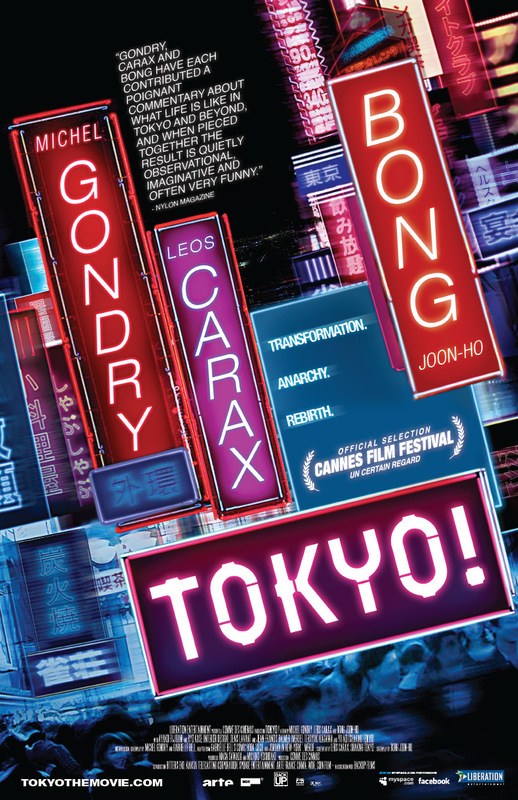 Michel Gondry, Leos Carax, and Bong Joon-ho are all powerhouse directors in their own respects. Gondry has made dazzling films like Eternal Sunshine of the Spotless Mind and worked on multiple music videos. Carax has been working since the eighties with his most recent success being the critically acclaimed Holy Motors. Bong has also become a directing commodity in South Korea after his smash hit film The Host. All of these directors, wether you’re fans of their work or not, are all exceptional film makers with their own visions and styles. Their collaborative effort, Tokyo!, that consists of three shorts films directed by each film maker offers a trippy view of the city of Tokyo, but it also provides a dreamlike and inspiring cinematic experience. In Michel Gondry’s segment, Interior Design, Hiroko (Ayako Fujitani) and Akira (Ryō Kase) are a young couple who have graciously accepted an offer by their old friend Akemi (Ayumi Ito) to stay in her small flat while they search for an apartment of their own. As time quickly passes, and Hiroko is having no luck in terms of employment and finding an apartment, she begins to feel completely worthless to herself and everyone. Things change in many different ways when an unbelievable physical transformation happens to Hiroko. In Leos Carax’s segment, a mysterious psycho from the sewers, referred to as Monsieur Merde (Denis Lavant) begins terrorizing the city of Tokyo until he is eventually arrested. A trial soon happens with a special lawyer (Jean-Françoise Balmer) brought in from Paris to represent Merde. During the trial Merde’s true intentions are discovered. In Bong Joon-ho’s segment, we see a shut in (Teruyuki Kagawa) who meets a woman during an earthquake who has buttons on her body that seem to control her functions and emotions. The shut in is then forced to leave his house and brave earthquakes in order to find this mysterious woman whom he has fallen in love with, even after spending ten years in his house. Gondry really has an amazing artistic eye but also a strange sense of humor and design that always makes his movies interesting. With his segment in Tokyo!, he has to pack all of that style and storytelling into a short film. What we get is a moving examination on young adult life and also a theme of self worth, which is told in the most unique way I’ve ever seen. Props have to go to Gabrielle Bell who wrote the short story comic that this is based off of, Cecil and Jordan in New York. For most of the segment, it’s a story about a young couple trying to really get their lives started, but it ends with a fairy tale ending of transformation that left me practically speechless. Gondry got his point across easily without being derivative, and this is easily the best segment of the entire film. Carax’s segment brought me back to the night that I watched Holy Motors and the mixed feelings I had about it. Luckily with his part of the movie, I got to see the first time Carax used his character Monsieur Merde, who also had a scene in Holy Motors. This is a strange story, possibly even as strange as Gondry’s, but completely different. I’m not entirely sure what this part is about, but Carax said that he simply got the idea of some sort of creature coming out of the sewers and killing people, so it might be a bit much to try and dig into it to find some deeper meaning. If I had to I’d say it would be about the ugliness of bigotry and hatred, but this could also just be a cartoonish entry that is meant to highlight the character that Carax created. Either way, this was entertaining as all hell and Denis Lavant showed me yet again that he is an underused and excellent actor. Finally, we come to Bong Joon-ho’s segment, which I think is the weakest of the entire film, but that’s not really belittling it since the first two were so over the top and awesome. This is a much quieter and human story with some really touching depictions of loneliness and love, even with a strange fantastical, almost science fiction twist. I kind of wish that this idea was expanded a little more because the buttons used to activate the woman’s emotions and actions was a cool idea. This is still a beautifully shot short film that shows the talent Bong has behind the camera as well as in writing. Compared to the other two, however, if could have a been a little stronger. Tokyo! was an excellent film that had strong entries by each of its three talented directors. I feel like a central theme that can be seen weaved throughout all of these unique tales is a theme of being alone in a city that is dense with millions of people who are going on about their own business, and not paying you any mind unless you give them reason to. Surprisingly, this wasn’t the uneven film that I heard it was. In fact, this film surprised me on many levels and I can highly recommend it to anyone and everyone. There are plenty of movies out there that are completely unique and provide the viewer with a different sort of experience. This is normally done through narrative tricks or special visual effects to really separate itself from other movies. In my opinion, there has never been a film as different and inventive than Gaspar Noé’s Enter the Void, a film that he calls a “psychedelic melodrama” that seems to defy all conventions of film making and takes a different approach at an art form that seems to have seen it all. Oscar (Nathaniel Brown) is a small time drug dealer and junkie who lives in Tokyo and mingles with the other assorted junkies and dealers. He shares an apartment with his sister, Linda (Paz de la Huerta), and shares a very special connection with her. One night, after trying to complete a deal with an old friend, the police burst in and shoot Oscar. What follows is Oscar’s consciousness or soul leaving his body and flying over the neon world of Tokyo, examining his past, and observing the lives of others that have been affected by his death with the ultimate goal of achieving some sort of resurrection. The way Gaspar Noé tells the story in Enter the Void is unlike anything I have ever seen. The movie’s psychedelic mayhem begins right with the opening titles that shock the viewers mind like a defibrillator. Once the titles end, it is strangely calm and the next odd choice by Noé is to have the first half hour completely in a first person POV of Oscar. After he is shot, we travel with him out of his body to experience his life flashing before our eyes and also see the effects of his own death. In this way, the film is still first person, but it’s a strange trip flying over the neon hell of Tokyo. Where a lot of film makers use CGI as a crutch and a tool to draw in audiences to see spectacular things, the CGI in Enter the Void is for a much more visceral experience. A large part of the story is the usage and effects of a drug/chemical called DMT, which is released by the brain en masse to a dying individual or to the user of the street drug. The effects of this is a vibrant, colorful visual experience which is recreated with the sights and sounds of Enter the Void. As a result, this is a very colorful movie at times, only to be momentarily defeated by the grime and darkness of the deepest alleys of Tokyo. It’s a beautiful contrast, but certainly not the only unbelievable part of this film. Fortunately, this Noé did not rely on visuals alone to make this movie compelling. The story and theme of the whole things made me revert into my own psyche and think about everything I believe is to be possible after we die. The thought of death is frightening, to simply not exist anymore, and there are so many thoughts as to what happens after our life ends. In Enter the Void, we are presented with one of the thoughts and is put on screen. It’s hallucinatory and even though the themes might be beyond our understanding, it’s still a deeply personal journey. This movie has polarized audiences since it was shown on the festival circuit, and was hurt a little after it’s poor box office return. This isn’t a mindless piece of entertainment. It is an art film through and through that really makes you think. I know I say that a lot, but it’s been about a week since I watched this and it’s still fresh in my mind. 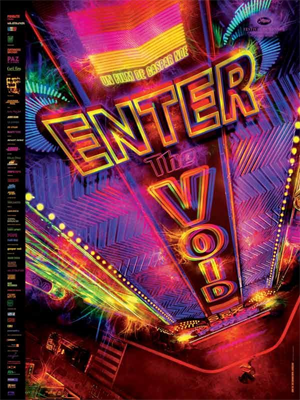 I can not recommend Enter the Void enough.